With the new season underway do you know your Sunweb from your Sky, your Michelton from your Movistar? 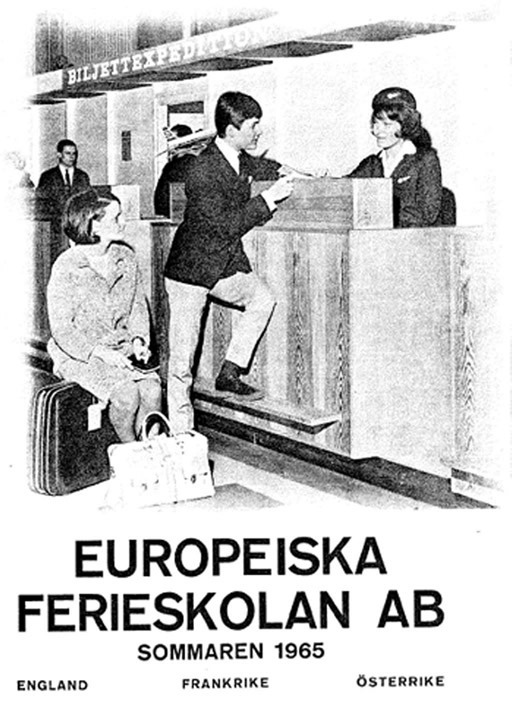 Do you know what the EF in EF Education First stands for? No, this isn’t a trick question, the answer’s below and you can also learn what CCC means as well as an explainer for all the 18 World teams for 2019. 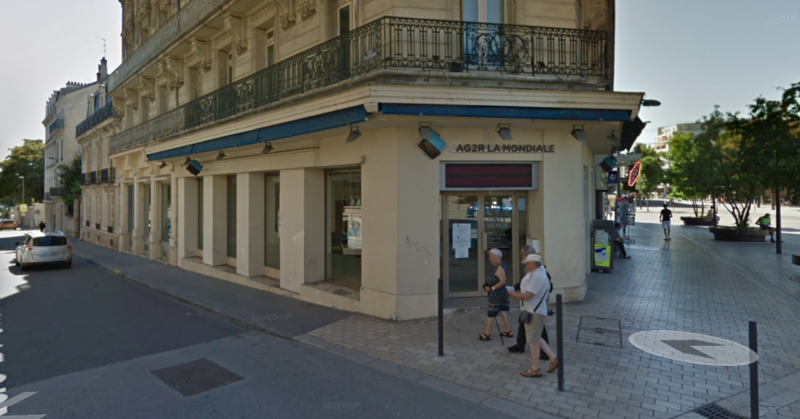 Ag2r La Mondiale is a French social insurance company, offering health insurance and pension plans to savers in France. It’s mutually owned and on the verge of completing a merger with Matmut, another mutual, which will propel it into one of France’s biggest insurance companies with 650 agencies across France. The enlarged group could be renamed so watch out to see if the team gets a rebrand mid-season. Astana is the capital of Kazakhstan, a gas-rich former Soviet state that’s the size of Western Europe. There’s been a small change with the team having been funded by the state sovereign wealth fund Samruk but when wages dried up the team was moved under the roof of the Presidential Professional Sports Club which is what it says it is and includes football, ice hockey, basketball and boxing teams. 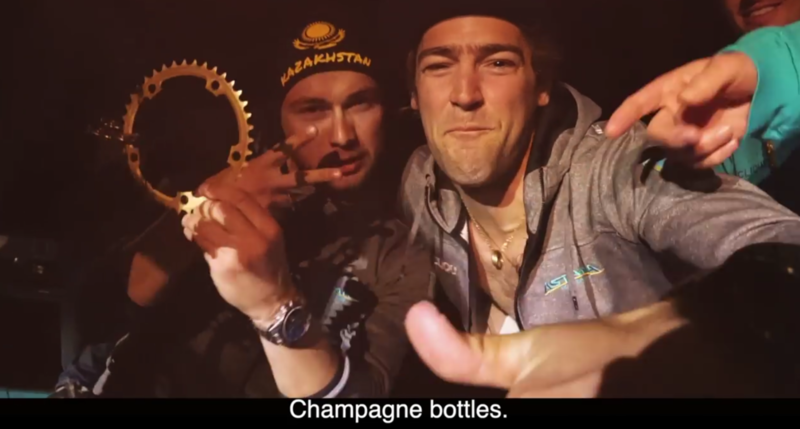 You can’t buy some Astana, the team rides to promote the country, a bid to counter the “Borat” image of Kazakhstan and pesky reports about dictatorship and poor press freedom… and their latest rap video helps distract from this. Bahrain-Merida bring some royalty to the sport, it’s sponsored by the eponymous island monarchy from the Persian gulf with his excellence Sheikh Nasser bin Hamad Al Khalifa (pictured), a member of the ruling royal family as the team owner and someone this blogger better say nice things about because you can get jailed for tweeting criticism. It’s got state partners from the oil company, an aluminium smelter and other agencies and new for 2019 is McLaren, controlled by Sheikh Nasser’s brother Mohammed. Merida is a Taiwanese bike manufacturer listed on the Taiwanese stock exchange and run by the Tseng family, it started out making Raleigh bikes under licence and now owns 49% of Specialized, but like many Asian manufacturers it wants to manufacturer and sell its own goods to enjoy higher margins. 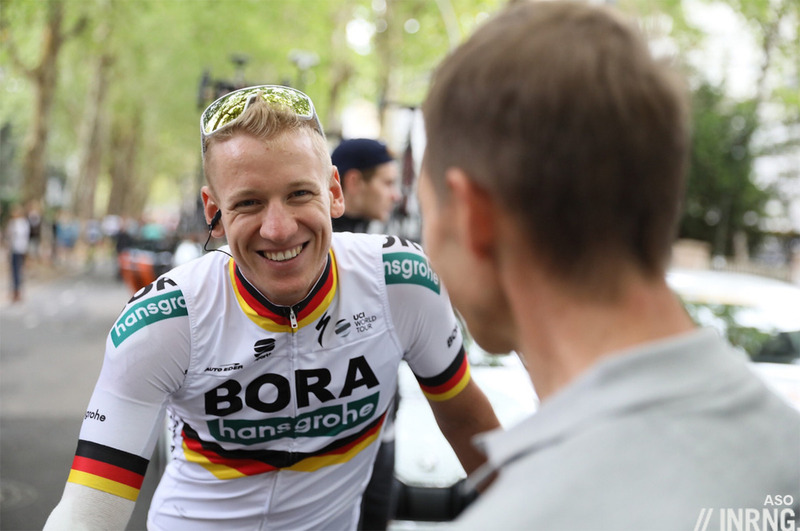 Bora-Hansgrohe is a German team sponsored by two Mittelstand manufacturers. Bora makes kitchen extractor fans with the selling point that the fans are located beside the cooking hob rather than above them and the firm has experienced prodigious growth since it started sponsoring a team. Hansgrohe make plumbing parts like taps and shower heads and if they have a Germany history since being founded by Herr Hans Grohe in 1901 are these days majority owned by US conglomerate Masco. The silent partner is Specialized, the influential bike brand was instrumental in bringing Peter Sagan to the team. CCC is a Polish footwear retailer with some manufacturing too. It started in the 1990s as Cena Czyni Cuda which translates as “the price makes wonders” and it’s a philosophy that’s sustained the company ever since, it stamps on costs whether in the supply chain or the retail experience. Visit a store and boxes are piled high with shoppers taking out of shoes themselves to try for size rather than an assistant shuttling back and forth between a store room, this means more retail space. It also appears to hold a perpetual 70% off sale which adds to the discount vibe. All this has made founder Dariusz Miłek a billionaire and CCC is one of the Polish stockmarket’s 20 biggest firms. What started in Poland is now international with a push into Germany, Russia and Switzerland recently and the pro team will help with marketing, if you’ve seen the Reno logo on the jersey it’s the brand name for CCC in Germany. Deceuninck-Quick Step is the new name for Quick Step and it’ll take some a while to learn the spelling and pronunciation, der-kho-ninck will get you started. 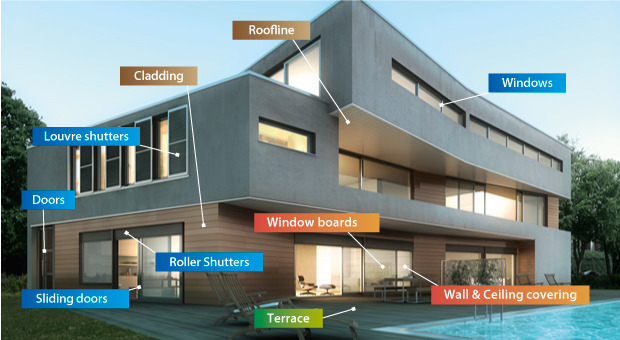 Deceuninck is a Belgian maker of PVC windows and cladding, mainly for industrial and office buildings and has sales across Europe and North America, it’s on the Euronext stock exchange with a market value of €280 million today. Co-sponsor QuickStep may seem quintessentially Flemish but it belongs to company founded in Amsterdam… Amsterdam, New York called Mohawk Industries, a giant supplier of commercial and residential flooring. It all vibes construction sites which part explains the blue overalls team kit but Zdeněk Bakala is the majority owner and the Czech billionaire is said to fund the team as well giving them a white collar touch too. Groupama-FDJ is 50-50 joint venture owned by its two sponsors. If you want to sound très French then pronounce it it Groupama-FDG. Groupama is a giant French mutual insurance company – and rival to the Ag2r-Matmut merger described above – and with a rural logo which hints at the original name Groupe des Assurances Mutuelles Agricoles. FDJ is short for La Française des Jeux. 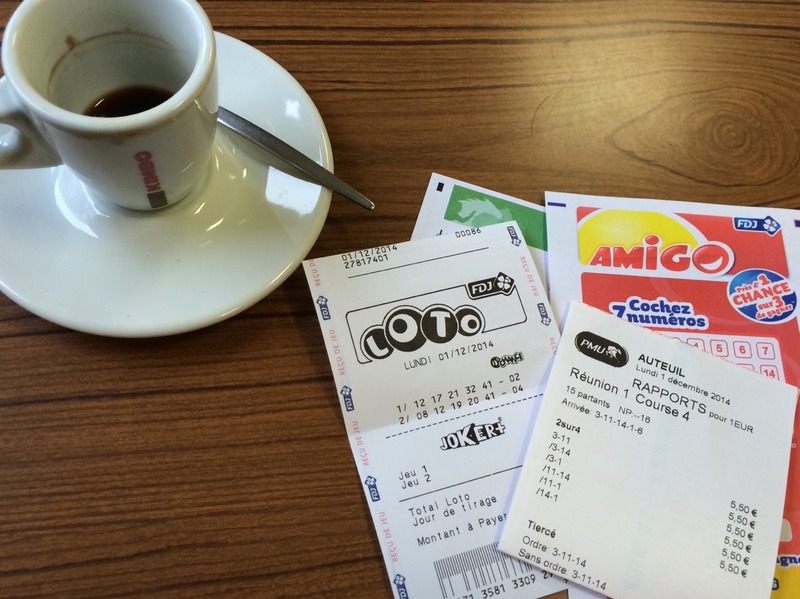 It’s the French state lottery but only just as its in the throes of privatisation and we’ll see if this changes marketing priorities or not. Team owner Marc Madiot is a keen patriot – he’ll blast the French anthem on the team bus for Bastille Day – but with a sideline in Americana thanks to his cowboy boots and a Corvette at home and values national champions to the point of removing sponsor logos from their jerseys so sacrosanct are they. Jumbo-Visma are the old Lotto-Jumbo. Dutch supermarket chain Jumbo – say Yumbo – has stepped up to the top name with a long term sponsorship deal. They’re family owned, growing fast across the Netherlands to become one of the leading food retailers and are now expanding into Belgium. 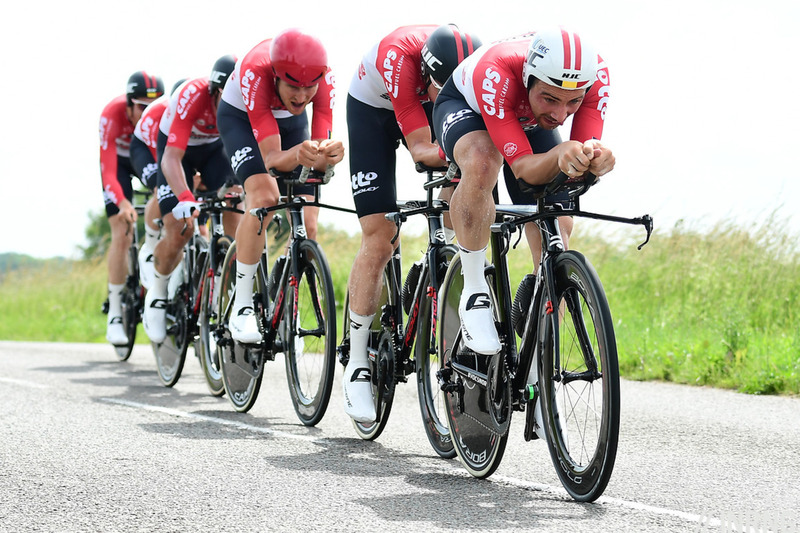 The supermarket’s payroll had been managed by a firm which was recently taken over by a Norwegian software and services firm called Visma… which has now come on board with the cycling team too after the connection was made at work. Katusha-Alpecin are a Swiss team of sorts. A team can register under any flag it wants and this switch from a Russian identity sees the team trying to distance itself from its image as Team Kremlin but a flag can only do so much. They’re certainly not Team Heidi, after all Katusha is the diminutive version of Ekaterina, Catherine in English and a famous Soviet wartime folk song in Russia which still gets patriotic hearts stirring today. In English you’d call them Team Kathy but it’s not just a name, they’ve launched a clothing brand too. 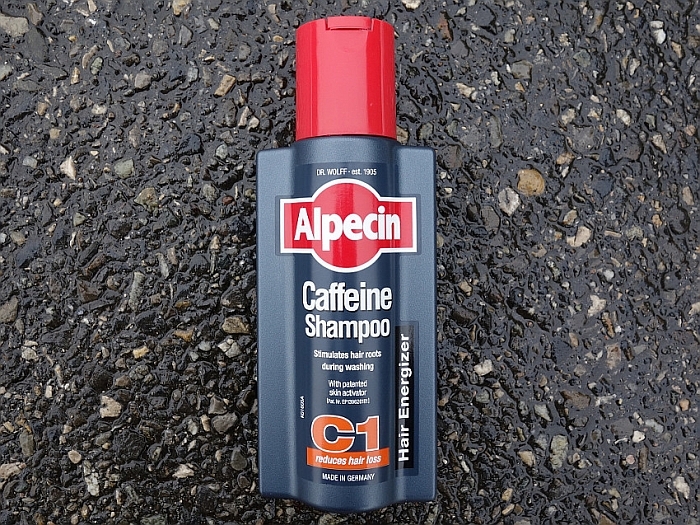 They’re joined Alpecin, the German brand of caffeinated shampoo. Lotto-Soudal is the longest continuous team sponsorship in the pro ranks with the Belgian state lottery backing a team through various name changes over the years ever since 1985. Soudal is a Belgian business making adhesives and sealants, a staple in DIY stores in Europe and beyond and the team has done some amusing sponsorship videos to highlight this, a means to bring alive otherwise dull products. Despite the pedigree and the government backing this is firmly Belgium’s second best team. Mitchelton-Scott‘s headline sponsor is a winery in Nagambie, Australia and a business belonging to team owner Jerry Ryan who’s become one of Australia’s wealthiest people thanks to his Jayco caravan business – these days Australia’s largest vehicle manufacturer – and an astute investment in the Walking With Dinosaurs franchise, the result of which is wealth and he’s ploughed a lot of this back into Australian sport, including this cycling team. Normally alcohol sponsorship is forbidden in France but the team isn’t troubled in the Tour de France because the winery is also a hotel and spa that caters for functions and weddings. Scott is a Swiss-American sports brand, registered in Switzerland but with a US heritage and if you know the frames they also make skis, ski poles and accessories for dirt motor cycling like body protection, goggles and more. Movistar is a mobile telecoms operator with activities in Spain and Latin America as well as in the UK and Germany under the separate O2 brand. Their rider roster reflects this geographic distribution perfectly with a Spanish core of riders from across the country plus Nairo Quintana of Colombia, Richard Carapaz of Ecuador, Andrey Amador in Costa Rica and Jasha Sutterlin of German, he’s linked to the team also via bike sponsor Canyon. Team Dimension Data for Qhubeka: is sponsored by a corporate cloud computing and IT outsourcing firm from South African with an international history. “Di Data” used to be traded on London’s stock exchange before it was acquired by Japanese telecoms giant NTT. The team has lost accountancy giant Deloitte but gained blue chip Alcatel-Lucent. There’s also Nederberg, a South African winery and the team retains the partnership with bicycle development charity Qhubeka. Team Sky is owned by the British media and telecoms company Sky which has recently been acquired by Comcast and as a result, marketing policy has changed and the sponsorship is being dropped and team management are busy looking for a replacement. They’ve long been the richest team in the sport and one of the few to publish their annual accounts. Team Sunweb are backed by a European holiday tour operator that is part of the Swiss-Dutch Sundio Group, essentially a Dutch company but with its HQ in Switzerland. Holiday makers in Northern Europe buy packages online to fly south: the sun via the web. Just as Sky’s sponsorship has ended because of a takeover, let’s hope Sunweb don’t follow because the company has just been bought by Triton, a German/Scandinavian investment fund but it should be ok, the investment seems to be about helping the company grow. It already turns over €600 million a year and last year took over a million people on holiday. The team’s DNA is Dutch but they fly under a German flag, presumably to help tap a big market and the team has Belgian steel shutter and blinds company Renson appears on the shorts. Trek-Segafredo is the combination of US bike brand Trek and Italian coffee Segafredo. Trek should be familiar while Segafredo literally means “cold saw” in Italian but it’s an Italian coffee giant controlled by founder Massimo Zanetti that floated on the stock exchange in 2016. UAE-Team Emirates is backed by the United Arab Emirates, a federation of seven emirates or kingdoms with Abu Dhabi as the capital and it also includes the city of Dubai, both cities with their own World Tour events. They were briefly the lowest budget team in the World Tour thanks to an in extremis rescue after Chinese sponsorship fell through but Emirates, the regional airline, has come onboard and brought millions in cash support: the team went from almost vanishing to one of the most wealthy and with a blue chip corporate name onboard. With this though has come expectations and they’ve signed Fernando Gaviria to make up for Alexander Kristoff’s lack of results and have had management shake-up to get more results. 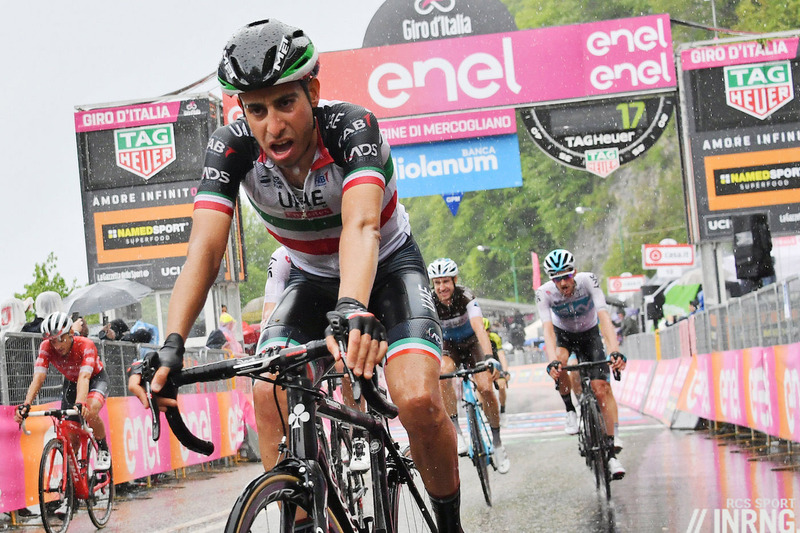 Despite the petrodollars the team is still quasi Italian with their Colnago bikes with Campagnolo and ten Italian riders but they do have UAE national champion Yousif Mirza too. Could the Ag2r merger finally spell the end for brown short? Quite possibly. The company tones are “terre et ciel” or heaven and earth which part explains the brown shorts and sky blue jersey. It looks ok when you see the riders on the road on a summer’s day, not something I’d buy but visit the Alps around Chambéry and it feels like they sell them by the box-load, eg ride the Chartreuse Trilogy and you’re bound to see locals going the other way decked out in brown. I don’t much mind the dark brown shorts anymore than dark blue or even dark green. What I HATE is white…or anything day-glo/neon/hi viz or whatever they choose to call those awful colors these days. Meanwhile, when is BLACK (other than on shorts/tights) going to go away? I’m amazed at the punters I see on the road almost invisible these daze in black helmet, black jersey, black shoes/socks, bike…like cartoon burglars. It could actually cause a brown pants moment for people at the team, if the newly merged company decides to review its marketing activities. Thanks for this, I always like a refresher course on where the money comes from to support the sport. Sadly, “…we still have a nexus of energy-rich authoritarian states as sponsors” as even the rich chamois-sniffers and bike companies decide the sport is no longer worth the investment. Good piece here https://www.velonews.com/2019/01/commentary/the-outer-line-mclaren-races-to-the-rescue_482838 explaining the sport’s latest “savior” pipe-dream. I understand how Michelton manage to avoid the ban on alcohol advertising in France, but how do Nederburg/Dimension Data get around it? I wonder the same, I think it’s just because nobody notices so much, it’s not the headline name nor a brand big enough in France so people notice it and complain. Perhaps the French just don’t acknowledge other countries’ wineries? ASO has had a deal with Chilean wine producer Cono Sur of Chile for the official wine supplier since 2015 I think… the result was threatened blockages in parts of France but these didn’t happen. The official wine of ASO is from Chile? Guess it should be no surprise after I saw bags of official frozen frites with the McCain brand on them. What’s next…the official baguette from the gawdawful Panera Bread chain? Sacre bleu! What next? Maybe RCS official cars from an Asian manufacturer? DaveRides- A couple of years ago RCS did indeed have Honda vehicles though I seem to remember a whole lot of Alfa-Romeo branded “Stelvio” and “Guilia” cars this past year. Back-in-the-day FIAT was the official car for both ASO and RCS as was SKODA, who is still with ASO I believe. But when it comes to gastronomy I find the French to be “distressed free-marketers” far more than Italians. They lament the loss of their local bakers and butchers while visiting the giant supermarket to buy bread and pastry wrapped in plastic. Italians are not as bad (yet anyway) and even the guide printed for the Giro d’Italia each year by the publishers of Bicisport features a local “don’t miss” dish or food product for each race stage. Both races seem open to the highest bidder, RCS will even go to Israel and has explored a start in Japan and Washington and is studying an offer from Brooklyn. It’s often business first, sport second and they’re both in a position to demand money, unlike most other races. Thanks for highlight where Reno comes from. 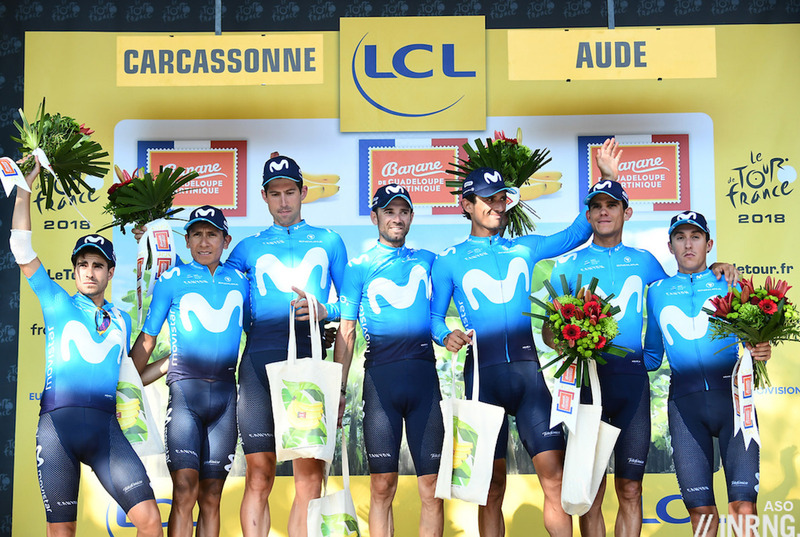 Interesting how CCC have the Reno name on the jersey , but Movistar do not have O2 anywhere on theirs. This seems sensible to me from CC and a missed opportunity from Movistar. Possibly this is down the the corporate structure of both companies and the level of Independence O2 has in the Movistar organisation? Is there no O2 this season? I recall seeing it on their arm over the last couple of years – a google image search for the jerseys says so for 2017 and 2018 anyway. It’s on the sleeves, I saw Sutterlin in the TDU breakaway with them. But it’s small, suspect most people won’t notice it, nor know what it means. Actually, the O2 brand is getting some momentum in Spain now. With the slogan “Respira” (“take a breath”), it offers low-priced, flexible phone and internet packages. btw: This post was a great, insightful, interesting read. Thanks for these many years of quality blogging! Am I right in thinking Comcast are prepared to support 70% of team sky funding for a period of time? La Gazzetta has reported this but their accuracy/rumour rate isn’t 100%, it could be right though, the exit was abrupt and you’d imagine Team Sky lobbied for this winding down. My battle-scarred head would very much appreciate a Bora appliance – do normal extractor vents have to stick out quite so much, and do they have to be pointy and metal? Prepare to open your wallet, while a normal hood is a three figure expense, Bora’s have an extra zero on the end. It’s a matter of the required air speed. Large kitchen hoods cost less because they use small motors and the duct design is not critical due to the low speeds. A system like Bora’s needs a powerful fan and very well built ducting. Hot air and gases rise, except in the world of Bora. And where is the used air expelled? It would / should be expelled at higher level (above roof eaves as often as not in the case of commercial premises) to avoid smell nuisance , so where does Bora’s ducting go? In simple terms: Reno (*1977) has bought CCC Germany (*2013) and will close or rebrand their 79 stores in Germany. In exchange for that the CCC mothership has bought 30-33% of Reno. I assume CCC must be making a push into Austria given that weird Zoidl signing to replace Denifil. There are quite a few CCC-stores in Austria. Around 10 of them alone in Vienna and nearly all of them inside shopping malls. The signing of Zoidl was a pretty good one imo since he’s had decent results during his time with Felbermayr-Simplon Wels in the past 2 years. You can expect him to be in breakaways during mountain stages. Arsenal FC certainly amused the locals when they played European ties in Italy with the word SEGA emblazoned on their shirts. The German registration for Sunweb made sense when they were still team Kittel/Degenkolb, but now that they are team Dumoulin/Oomen/Kelderman, it seems more logical to make it a Dutch team again. Interestingly, the men’s team only became a German team after Kittel and Degenkolb had both moved on from what was still Giant-Alpecin at the time. The commercial priorities clearly rank far higher than the identity of the key riders. The women’s team has retained a Dutch nationality the whole time. The team nationality concept is archaic and should be scrapped for WorldTour teams, or at least retained only where a team has all the naming rights sponsors and a majority of the riders and staff all from the same nation. Inrng, curious if there are UCI rules around a particular Sponsor not allowed to sponsor multiple WT teams? Something about teams working in conjunction due to sponsor pressure. I know Spez/bike and equipment sponsors supply multiple teams but they don’t have much say in the mgmt of the team. But a major sponsor, if doing the same could make lot of difference. Say, Merida (title sponsor of Bahrain-Merida) also sponsors (say) AG2R as bike supplier and minor sponsor, and then makes AG2R ride to help Nibali in the tour. There is a list of teams who cannot race together but this is teams and their feeder teams, eg the list isn’t out but CCC won’t be able to race with the CCC conti team. But in the past we’ve seen United Healthcare and Optum or Rally go head to head when they’re all the same company, Optum and Rally are subsidiaries of the US healthcare giant. Similarly Gazprom and Katusha have had some overlap in the past. But smaller links like bike sponsors are not blocked, you’re right to point to the potential for a conflict of interest, even if it doesn’t happen the sport should consider how to avoid it. The present WorldTour rules deal with this by banning the ‘principle partners’ (i.e. naming rights sponsors) of a team from having any relationship with another WT team. Looking back over the last ten years and the history of bike industry companies being major sponsors of WT teams, the only case I can find of a company being a major sponsor of one team and a sponsor/supplier of another is Shimano (when Argos-Shimano joined the WT ranks). In that case, it would have been reasonably easy to demonstrate that Shimano’s relationship with other teams was on the same terms it was previously. Bike manufacturers BMC, Cannondale, Cervelo, Fuji, Giant, Merida, Scott and Trek have all been major sponsors in that time, but never the bike supplier of another WT team at the same time. Beyond the ‘principal partner’ rule, the best way of dealing with it is probably to make sure the existing rules against inter-team collusion are able to be enforced properly, not to make up new rules. Doesn’t CCC go back to at least 2001? Great article as ever. Interesting how Katusha are funded by “ARETI” – or ITERA spelt backwards, formerly a gas company prior to being sold to Rosneft. I think ATERI’s major assets are now offshore Turkmenistan (having not been sold). Yes, Itera has been Igor Makarov’s firm, the Russian oligarch and keen cyclist behind the team, he’s also a member of the UCI management committee, surely the most powerful person in the UCI by far? He’s had a yacht called Areti too, it’s for sale, yours for $175 million just as long as you’re not a US citizen and/or you don’t buy it in US waters (don’t ask). As someone whose country has had the ‘temporary’ presence of the Krasnaya Armiya for 46 years, the Katusha name will always be synonymous with the WW2-era multiple rocket launchers. I wonder how long before “der-kho-ninck” makes me think of the cycling team and not an Antwerpen brewery? As insightful a round up as ever, thanks.